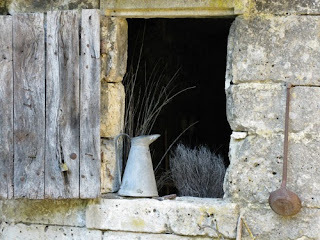 One of my favorite outings in France was The Troglodytic Valley of Goupillieres. This fascinating group of three working farms is both charming and historical. Take a step into the past with me. As I said, these are working farms, with crops and animals. 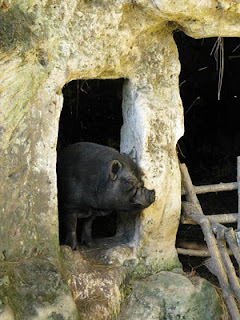 This pensive black pig posed for me in the doorway of his abode. 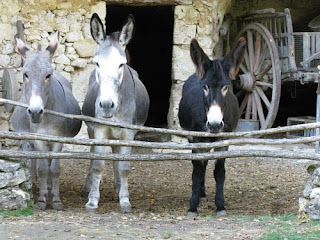 These donkeys were also working residents. Aren't they adorable? The farms are rather small, easily worked by hand and animal power, with only a few people. The people lived in caves, hollowed out of and built from tufa, the calcite rock of the hillside. This is the window of one of the homes. Although the caves were first used in the middle ages, they were lived in until the 19th century. Therefore some of the utensils and ameneties are relatively more recent additions. 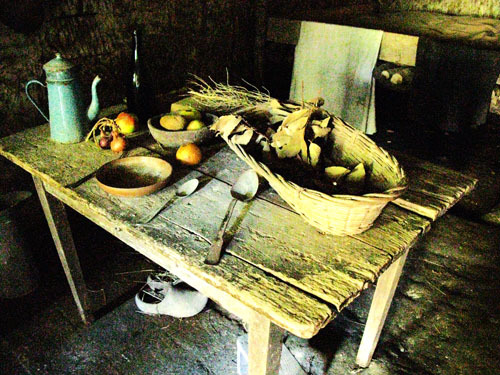 A table inside one of the homes shows the rustic charm and simple life lived by the peasants. I enhanced this image in Photoshop for drama and clarity. Needless to say, with only one open window and an open door, the back part of this small room was not very light. This was shot in available (ha ha) light, without a tripod. 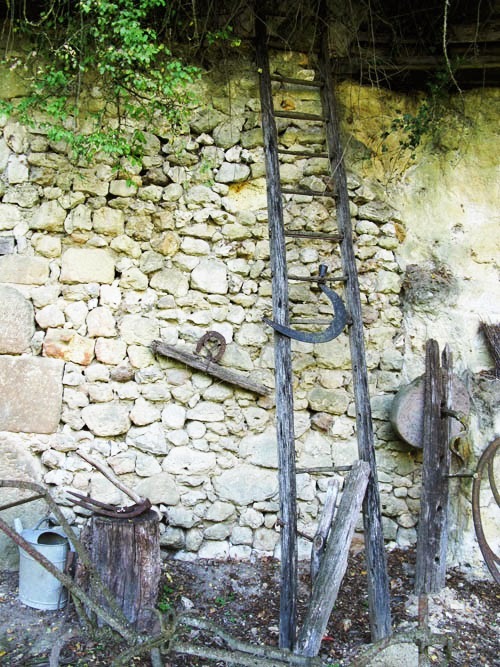 Back outside, you can see several home and farm implements: a metal watering can, parts of a plow, a sickle, and a ladder I would definitely not want to climb. 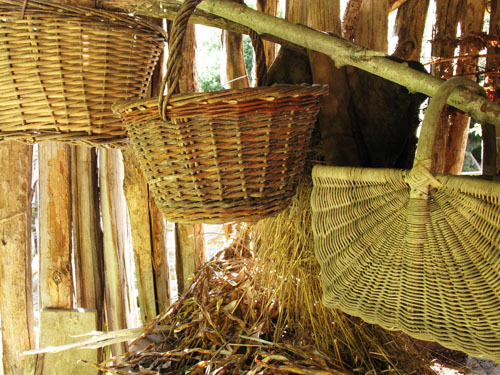 Self-sufficiency and using available materials were essential to these people's lives. A rustic shed housed home-made baskets and the materials for making them. And forget about a hot shower or running water. 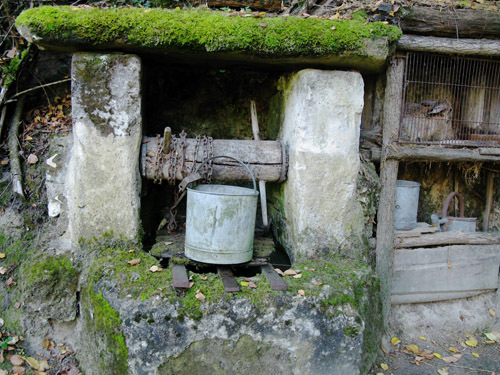 You want water? Draw some yourself. And I'm not talking about artwork! 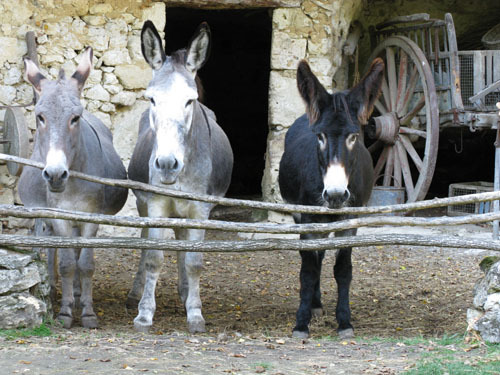 Remember those donkeys at the top of the page? They came in handy for pulling plows and carts, and perhaps even something as large as this blue wagon, though I'd think a horse would be more appropriate. Lovely color, n'est-ce pas? 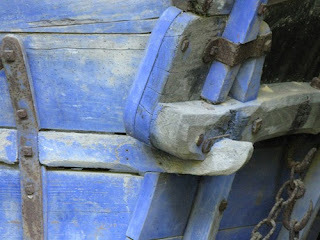 The wagon hitch was also lovely, in a very rustic sort of way. It doesn't seem to have been used recently, judging by the moss growing on it. There were many other interesting sights I haven't included photos of here, including some vegetable plots and an interesting trick cave, which was a safety device that would send invaiders in circles inside it while the people hid safely below. But be careful, and don't back up in this room, or you could easily suffer a bad injury! 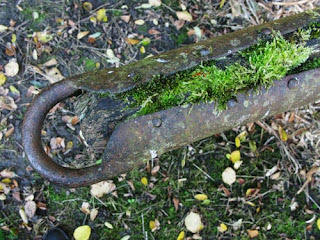 It's a pretty steep drop to the underground area, and there's no protection around the opening, just a small piece of rope "fence" a foot off the ground. Oh yes, I forgot to mention, all the homes had packed dirt floors. 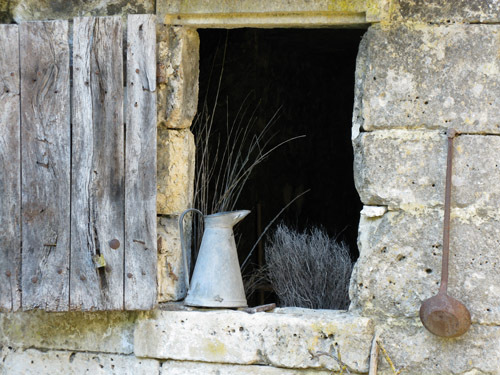 Like the Flintstones, only with an abundance of French country charm! If you decide to visit this amazing site, be aware that the guided tour is only given in French. However you are welcome to roam about the place on a self-guided tour. Also, note that when their website says, "Free visit with printed guide" what it really means to say is that there is a free printed guide with your paid visit. The printed guide is available in several languages, including English. Be sure to check the current open hours and admission fees before visiting. For some reason I want to see the inside roofs of these places. I want to know how these are being held up. Are there branches or boards keeping the dirt from caving in above their rooms? Otherwise a charming existence, though a lot of work I'm sure it must have been. Thanks for sharing such a great visit and shoot.